For those following along, they’d probably realize by now that I have left the country and are officially on holiday in the slightly-warmer-than-average-for-this-time-of-year Hong Kong. I had originally planned to make this post before I left home, but things got in the way, so now it’s happening remotely. A while back, out of my own curiosity and armed with a DC electronic load, I decided to test a vast selection of alkaline AA batteries. 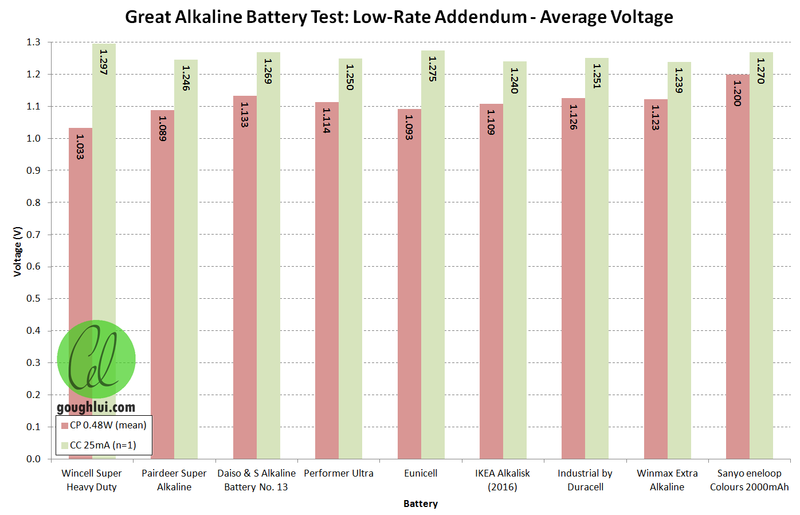 This resulted in the four-part “Great AA Alkaline Battery Test” series (Part 1, Part 2, Part 3, Part 4) where over 100 individual cells were tested, taking around 22 days of test time. The tests were done at Constant Power (CW/CP) mode at a load of 0.48W, a compromise “higher level” load which I justified as being more relevant to the modern switching-converter based electronics in use today. This test protocol also had the advantage of being fast to administer, allowing a sample size up to 4 cells per type, and reducing any discrepancies that may arise due to cell storage. the fact that lower drain devices are less likely to see as large of a capacity difference between different brands of cells as it is less demanding on the cell. that better performing cells at high loads are likely to correlate well with good performance at a low-level current drain. that ultimately, high level current drain performance is more important as you go through more cells, more quickly, and combined with the first point, means it has the bigger financial impact. and that Ni-MH cells outdo alkaline cells (in general) just extrapolating from the high-load data. Because I felt the shortcomings of my original study were significant enough to warrant a follow-up investigation, I’ve worked hard, spending approximately 950 hours of test time to do some additional testing to see whether my assertions were correct. This addendum proved to be an even longer experiment than the original CW test. 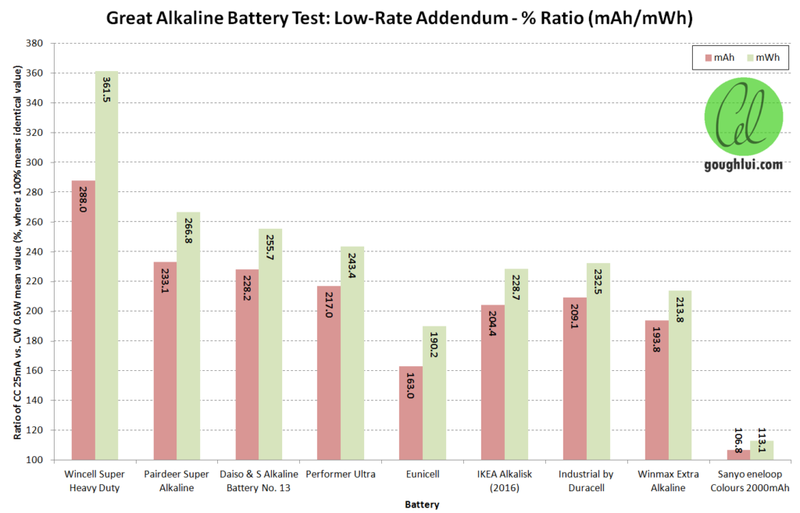 The test methodology follows the use of the same equipment and protocols as that of other “Great AA Alkaline Battery Test” articles, so I won’t bother fully describing it here. However, there are variations. For one, the test regime is a CC 25mA discharge, instead of CW 0.48W. Secondly, only one sample was tested for each candidate cell type. The cells all came from the same batch (namely, the “extra cells” in the pack not used in the previous test). A selection of cells across a range of performance levels were chosen based on the previous results, taking care to choose cells where the tested population showed low variance (to hopefully improve the quality of the data from the single tested cell). In some cases, cells of similar performance were chosen as well, to allow for comparison between similar high-rate performances. These were referenced to a single Ni-MH cell and carbon-zinc cell. A total of nine cells were tested, including these reference cells. Due to this, drawing firm conclusions is made slightly difficult by the infinitesimal sample size of one, but even just one result could be enough to cast doubt upon the assertions I had previously made, so it is worth doing. As tests do take around 5 days of continuous discharging per cell, some small variations in temperature were unavoidable, as the air conditioning was struggling to keep up with Sydney heat-wave conditions (which are still persisting as we speak), however, the impact appears to be minor (slight variations in voltage with a diurnal pattern). The results are summarized in the table below, with a downloadable PDF file here. Please note that this information is compiled based on experiments run by a hobbyist at home, on a single sample of cell, and not a standards institution. The standard disclaimer applies – I cannot guarantee this information will be correct under your load conditions or even with your batch of cells. The information is provided in good faith with no warranties whatsoever. I cannot be held liable for any damages howsoever incurred. Apologies, as the table is a bit small and presents poorly, so do click on it to get a larger view. The statistical calculations are made across the alkaline population only, excluding the reference cells. The lower rate discharge at CC 25mA allowed the cells to deliver about 200% (+/- 50% approximately, for 95% confidence) the capacity as at CW 0.48W. The average cell voltage was 1.253V for a 0.8V cut-off. This is still below the sticker-label 1.5V nominal voltage claimed. The range between the highest cell and lowest cell is roughly 25% in capacity in both discharge cases, however, the worst performing cell in the high-drain test was not the worst performer at low-drain. The capacity of the Ni-MH cell was largely rate-independent, and thus delivered less than all tested alkaline candidates at the 25mA rate. We can examine the results a little more closely. 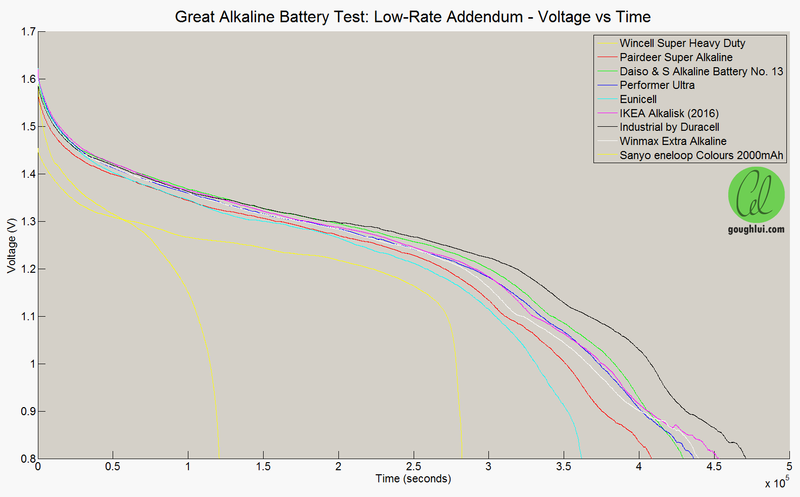 Looking at the voltage curves, the alkaline cells showed a relatively-typical curve, with some bumpiness towards the end. Cell voltage initially drops relatively steeply, flattening out, before then dropping more steeply again after reaching 1.2v. By comparison, the Ni-MH cell was only slightly more stable for voltage, however, remaining well below that of the alkaline. However, since the fall-off in the Ni-MH curve is quite steep, the average discharge voltage is still comparable to the alkalines, which spend a lot of time “slowly” falling in voltage. This seems to suggest that even at low rate, there isn’t much evidence to support Ni-MH voltage as being a major issue in any way. 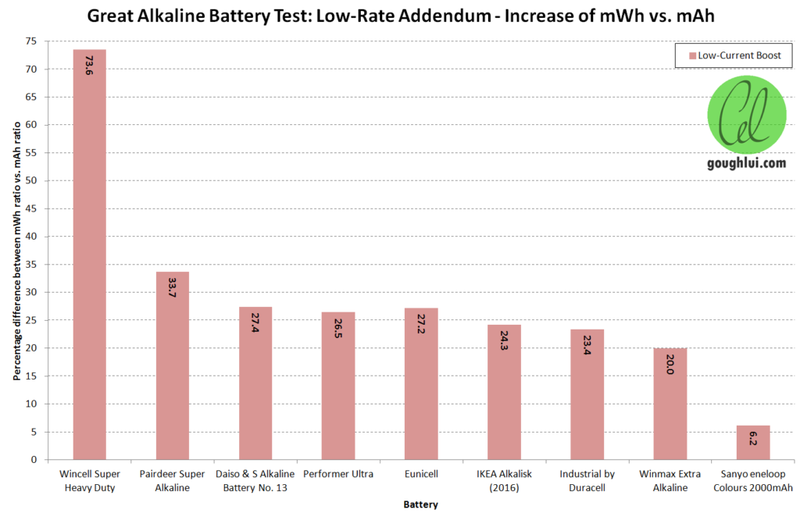 When combined with what was previously established at high rate, I don’t feel that the 1.2v “nominal” rating actually compares poorly with alkaline cells in practice, making higher-voltage rechargeables like Ni-Zn a “moot point” when it comes to matching alkalines. The carbon-zinc cell was more competitive for capacity, but still far behind that of its alkaline peers. In terms of mAh capacity, the cells are ranked based on their CW 0.48W average results, plotted in the pink bars. The mAh capacity established under the CC 25mA regime is plotted in the green bars. The Ni-MH cell showed marginal improvement, whereas the rest of the cells showed significant gains implying internal-resistance/chemical-diffusion related difficulties at high currents which Ni-MH does not suffer from. From the height of the green bars, it’s clear that some high-performers at high current do not translate to equally good low current performance. The Eunicell, IKEA Alkalisk, Industrial by Duracell and Winmax Extra Alkaline are all vaguely similar performers with a tight tolerance, however, their low-current draw results differ markedly. The Eunicell proved to be a big disappointment in comparison, producing the lowest result in this test. This may or may not be an outlier, as the sample size of one does not give us any firm data. However, even amongst the remaining cells, the best performing Winmax Extra Alkaline cells came third, with IKEA Alkalisk coming second and Industrial by Duracell edging it out for first. The differences are not too big, but the change of relative ordering may indicate the bigger intricacies of battery design – namely having enough active material (to produce the necessary capacity), and making sure it is in a form that is usable with a low-enough internal resistance (for high current). More information that seems to support this stance was the significantly poorer-performing Pairdeer cells, while still being relatively poor compared to the remainder, delivered the biggest gains from going to low-rate discharge. A similar result is given for the mWh graph, with the gains somewhat boosted by the higher average voltage, especially in the case of the carbon zinc reference cell. The average voltages were compared on a graph – there appears no real correlation between CP and CC average voltage trends, although the range of values is relatively small. Looking at the ratio of CC results vs CW results, the largest gains were for the carbon zinc, and in general, as the capacity at CW increases, the gains from moving to CC low-rate discharge diminish somewhat, which may indicate ultimate capacity limitations due to how much usable active material you can fit into the cell. The greater increases for poorer-performing cells may point to a poorer cell design, or active material which isn’t usable due to poor diffusion to electrodes. The Eunicell result is notably atypical. Finally, taking the difference of the mWh percentage from the mAh percentage above gives us the amount of percentage gain of mWh between the CW and CC tests that is due to increased terminal voltage alone. This seems to decline as the cell capacity increases. In all, it turns out that this exercise was indeed worthwhile. Even though the sample size is very small, at one cell per type and only seven alkaline types tested, it is still illustrative. My own thoughts are seemingly contradicted by the data I have collected, and I am happy to have learnt something. It seems that the percentage difference in capacity across the tested (smaller) population at low-rate is of a similar magnitude to that at the high-rate, and that high-rate performance is not a great predictor of low-rate performance for some of the tested cells. At the CC 25mA load condition which is frequently used by manufacturers to make raw capacity claims, the approximate capacity for alkaline batteries is twice to three times as much as that reported by the CW 0.48W due to the reduction in influence of internal resistance (which results in increased average voltage under load) and increased time for chemical diffusion to occur within the cell. Such gains were even greater for the carbon-zinc which was overstressed at the CW regime. 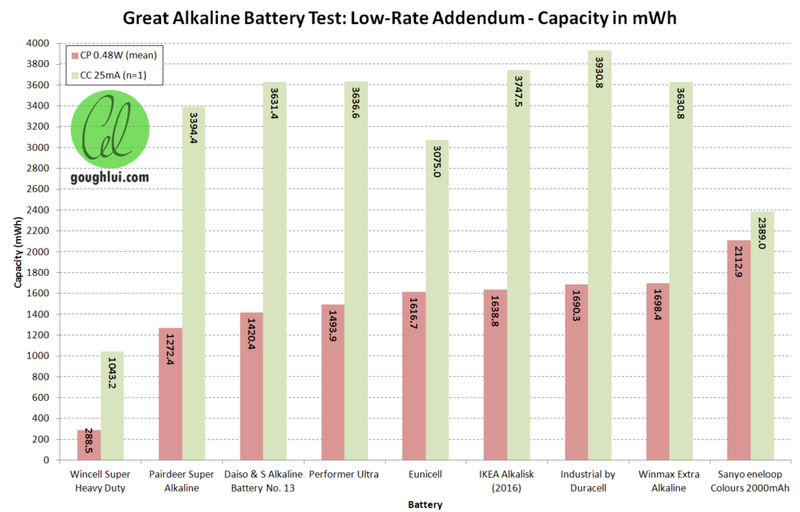 Such gains were not realized for the Ni-MH cell which presented a much more “load-independent” capacity which was less than the alkaline cells at CC 25mA, thus proving that alkaline cells can exceed the performance of Ni-MH cells but only at light loads. The odd result from the Eunicell was based on a random-pick of cells from the same batch. It could be an outlier in the sense it may have been a faulty cell, however, this is not certain. Due to the long test regime, and lack of time (as this test finished two days before I was due to fly), I am not able to confirm this.